Miele Complete C3 Canister Vacuums are group of corded canister vacuums that offer large radius of operation, good air filtration, variable speed motor, good suction and many attachments for thorough cleaning from floor to the ceiling. They are not the cheapest vacuums around, but they are made in Germany, they do their job properly and they come with nice warranty. In order to distinguish them, Miele Complete C3 Canister Vacuums differ in color. They also differ in cleaning attachments and many other features and specifications. All Miele Complete C3 Canister vacuum cleaners come with 1200 W Vortex Motor which ensures good suction. Also, all models come with AirClean Sealed System, 4.76 quart Type G/N AirClean FilterBag™ with spring-loaded self-sealing collar, and three fully integrated tools: SSP 10 Dusting brush, Standard Upholstery tool, and SFD 10 Extended Crevice tool. They also feature Telescopic stainless steel wand and 36′ (11 m) operating radius. Miele Complete C3 Alize: silent motor with 6 speed settings controlled via +/- footswitch controls, automatic speed control setting, spotlight handle, HEPA AirClean filter, SBD 650-3 AirTeq floor brush, recommended for low pile carpeting, rugs, & hard floors. Miele Complete C3 Brilliant: silent motor with 6 speed settings controlled via handle controls, automatic motor setting, LED lighting on sides and bottom of the canister, SEB 236 Electro Premium Electro brush with LED lighting, SBB 400-3 Parquet Twister XL, SBD 285-3 AllTeQ Combination smooth/carpet floor tool, recommended for all flooring types. Miele Complete C3 Calima: silent motor with 6 speed settings controlled via +/- footswitch controls, HEPA AirClean filter, STB 205-3 Turbo Brush, SBB 300-3 Parquet Twister, recommended for low pile carpeting, rugs, and hard floors. Miele Complete C3 Cat & Dog: silent motor with 6 speed settings controlled via +/- footswitch controls, Active AirClean filter, SEB 228 Electro Plus Electro brush, SBB 300-3 Parquet Twister, recommended for all flooring types. Miele Complete C3 HomeCare: silent motor with 6 speed settings controlled via +/- footswitch controls, HEPA AirClean filter, Optional Electric floor brush (SEB 217-3, SEB 228, or SEB 236), SBD 285-3 AllTeq floor brush, recommended for all flooring types (depending on optional Electro Floor brush selected). Miele Complete C3 HomeCare+: silent motor with 6 speed settings controlled via handle controls, automatic motor setting, 36″ operating radius, SEB 236 Electro Premium Electro brush with LED lighting, recommended for all flooring types. Miele Complete C3 Kona: silent motor with 6 speed settings controlled via +/- footswitch controls, HEPA AirClean filter, SEB 228 Electro Plus Electro brush, SBB 300-3 Parquet Twister, recommended for all flooring types. Miele Complete C3 Limited Edition: silent motor with 6 speed settings controlled via +/- footswitch controls, AirClean filter, STB205-3 Turbo Brush, SBD 285-3 AllTeQ Combination floor brush, recommended for low pile carpeting, rugs, and hard floors. Miele Complete C3 Marin: silent motor with 6 speed settings controlled via +/- footswitch controls, automatic motor setting, HEPA AirClean Filter, SEB 236 Electro Premium Electro brush with LED lighting, SBB300-3 Parquet Twist, recommended for all flooring types. Following table compares Miele C3 vacuums features and specifications. – we have really tried to verify every single bit of information in this table (and not only in the table, of course), but things change over time, so we cannot guarantee 100% accuracy of data. 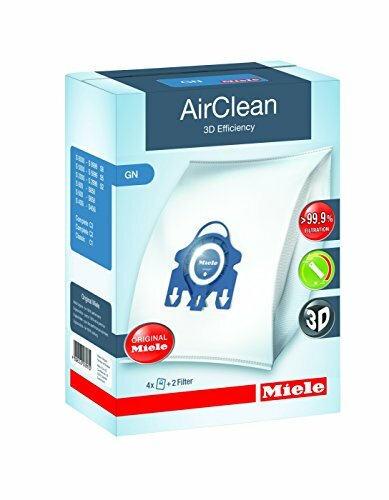 – Miele Complete C3 Limited Edition has ‘ordinary’ AirClean filter, which can be replaced with Miele HEPA AirClean SF-HA 50. Miele HEPA AirClean SF-HA 50 meets Europe’s HEPA13 standards, capturing over 99.95% of all particles. It is designed for Miele’s S4000, S5000, S6000 and S8000 canister vacuum cleaners. – Miele Complete C3 Cat & Dog uses Active AirClean filter, which uses active charcoal layers to neutralize and absorb unwanted pet odors and provide exceptional air filtration. – all other Miele Complete C3 models uses ‘HEPA AirClean Filter’. So, if you really need HEPA level of air filtration, Miele Complete C3 vacuums are excellent choice, just be sure to use HEPA air filter in ‘Limited Edition’. And if you have pets, feel free to consider ‘Cat & Dog’ model. Miele C3 vacuums come with various cleaning attachments suitable for various areas and surfaces. Here is the list of some most common ones. Standard Upholstery tool is suitable for cleaning most common small areas including upholstery, furniture and hard to reach areas like edges, corners, stairs and similar. Miele SFD 10 Extended Crevice Tool is extra long crevice nozzle which fits standard nozzle. It enables one to clean in narrow spaces like behind and below beds and other furniture, between car seats, and in any tight spaces. SSP 10 Dusting brush uses soft bristles, and gently cleans delicate surfaces like sculptures, picture frames, monitors and similar sensitive objects. SFD 20 Extended flexible crevice tool is excellent cleaning tool for reaching around furniture and appliances. Extended flexible crevice nozzle bends easily and cleans efficiently areas that are often impossible to reach and clean with other cleaning tools. SUB 20 Universal dusting brush has soft bristles and a swiveling neck, and is excellent cleaning tool for dusting bookshelves, mantles, moldings, ceiling fans, sculptures etc. STB 101 Mini Turbobrush is hand held tool ideal for vacuuming cut-pile and sensitive carpets and delicate upholstery, heavily-trafficked stairs, it can clean crumbs and pet hair from furnishings with ease. It is suitable for smaller surfaces. STB205-3 Turbo Comfort TurboBrush contains a rotating roller brush that works to loosen the dirt in the floor while collecting lint and thread. Loosen dirt is easily vacuumed with the rest of debris. SEB 217-3 Electro Comfort Electrobrush is mid-size, electrically-driven carpet tool with 10″ (~25.5 cm) wide brush roll and swivel neck design. It is great cleaning tool for low to medium-pile carpeting, with great maneuverability and can also reach under the furniture and other areas like corners, stairs, edges and similar. SEB 228 Electro Plus Electrobrush features a five-level height adjustment, making it great cleaning tool for medium to high-pile carpeting, as well as smooth surfaces.